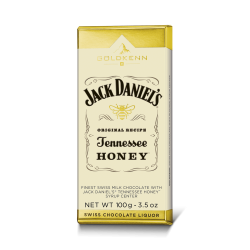 Sugar, cocoa mass, cocoa butter, Jack Daniel’s Tennessee Whiskey 8.5%*, inverted sugar syrup, whole MILK powder, BUTTER, humectant (sorbitol), glucose syrup, butterfat, SOYA flour, emulsifier (soya lecithin), concentrated lemon juice, salt, natural vanilla flavour. Cocoa: 50% min. 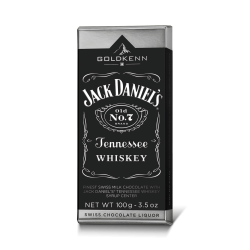 in chocolate. Contains soya, milk. May contain traces of almonds, hazelnuts, peanuts.